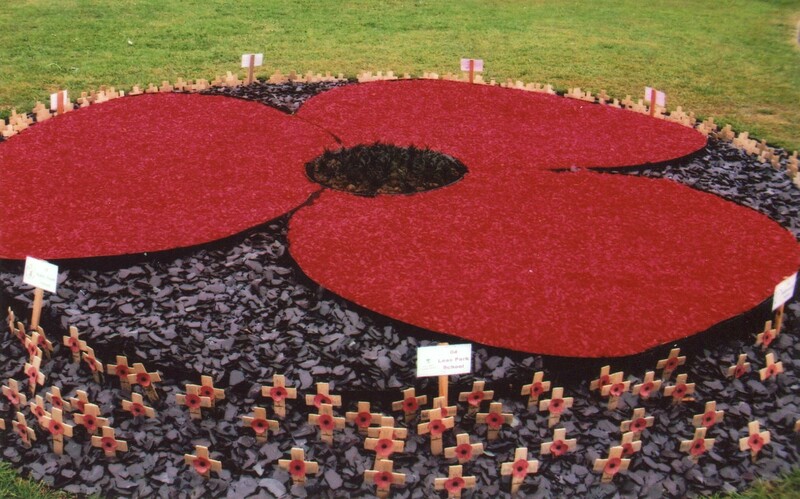 This poppy of red granite was laid in Yeoman Park to commemorate the start of the First World War. The poppy crosses each bore the name of a person who died in the war and were planted by groups of children from each of the schools in Mansfield Woodhouse. The idea came from the WWI Commemoration Group, hosted by Mansfield Woodhouse Community Development Group (MWCDG). The WWI Group is made up of representatives from Scouts, Sherwood Foresters, RAFA, Drum and Bugle Corps, St. Edmund’s Church, The W.I., Triangle and The Old Mansfield Woodhouse Society. The original photograph shows the Poppy Garden’s first design, which used powder coated gravel, unfortunately the red colouring was eventually washed off the gravel and so it has instead been replaced with a resin bonded cement which will hopefully stand the test of time. The Poppy Garden is used annually between 2014 – 2018 by the WWI Group in association with local schools to pay tribute to those who fought and fell in the Great War. It is hoped that beyond 2018 it will be retained as a permanent feature in Yeoman Hill Park. Sorry!! I forgot to mention MDC Parks Dept were responsible for the construction of the Poppy design, well done!!! I’ll try to find out whose idea it was and give them the credit they deserve!! Thanks Alan for your comments, The Old Woodhouse Society along with the MW Community Group and other agencies organised a Church Service in the morning and an exhibition in Turner Hall in the afternoon. The Excelsior Dance Group danced a ballet of the War callup, fighting and injured and the Dead coming home, fabulous and emotional Service. In the Exhibition there were artefacts loaned by local people, Brass Band, Male voice Choir and re-enactment of the Christmas Truce. There was photographs of Woodhouse People who fought, all in all it was a well organised day!! The photos are now on display in the Library Heritage Link!! Joyce Baker, nee Hargreave of Woodhouse Quaker Meeting.